Twenty years ago a guy knocked on a farmer’s door in Matamata, New Zealand. The resident was watching the rugby and was nonplussed when the visitor asked if he could look round his farm. Said visitor was a film scout for Peter Jackson, who was planning a film version of Tolkien’s epic fantasy tome. “The Lord of the what?” asked the owner, before his son persuaded him this was a once-in-a-lifetime opportunity. The farmer agreed, and before long Jackson and company transformed part of his land forever. 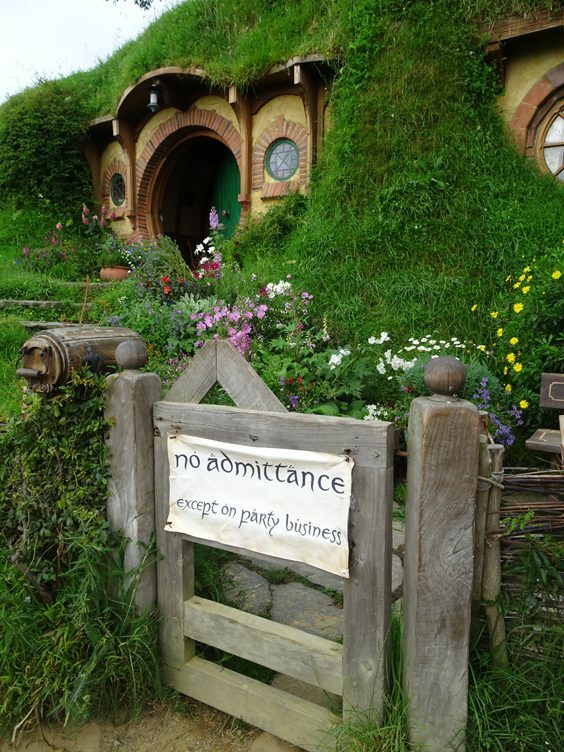 I get the feeling that story has been told countless times in the years since The Lord of the Rings and The Hobbit movies helped turn Matamata and New Zealand itself into major tourist attractions. Wandering around the stunning sets I’d witnessed many times in some of my favourite films is a surreal experience. (The permanent set was rebuilt for The Hobbit films a few years ago). It’s still early and the weather is a little overcast in Matamata as coach loads full of tourists like me and my partner take photos and pose by hobbit doors. Even if you’re not a fan, the place is an oasis of calm and very tastefully done. This is our third Tolkien-related excursion in as many days, having recently explored the forest in Wellington where hobbits encountered evil Black Riders, and the stunning Mount Sunday, which formed the backdrop for the Golden Hall of Edoras. (The structure was dismantled years ago, but it’s such a breathtaking region, it hardly matters). This dream trip is the result of a lot of planning, and even more saving. Having turned 50 a few months earlier, my mission was to not let the year go unmarked, but have the mother of all adventures. So, after an epic journey from Howden to Heathrow on Christmas Eve (not for the faint of heart), Rachel and I fly to Sydney (via Beijing), and enjoy a few days exploring the iconic Australian city before boarding a luxury cruise liner and setting sail for New Zealand. The trip is nicknamed ‘Across the Ditch’, an affectionate term for crossing the Tasman Sea between Australia and New Zealand, and vice versa. 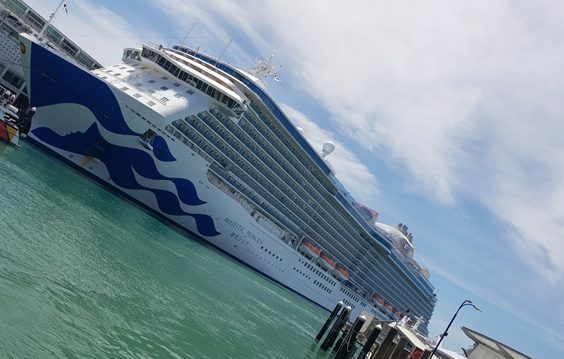 Our home for almost two weeks is the same ship featured in the latest run of ITV’s The Cruise, and for this veteran of assorted other voyages, the Majestic Princess more than lives up to its name. 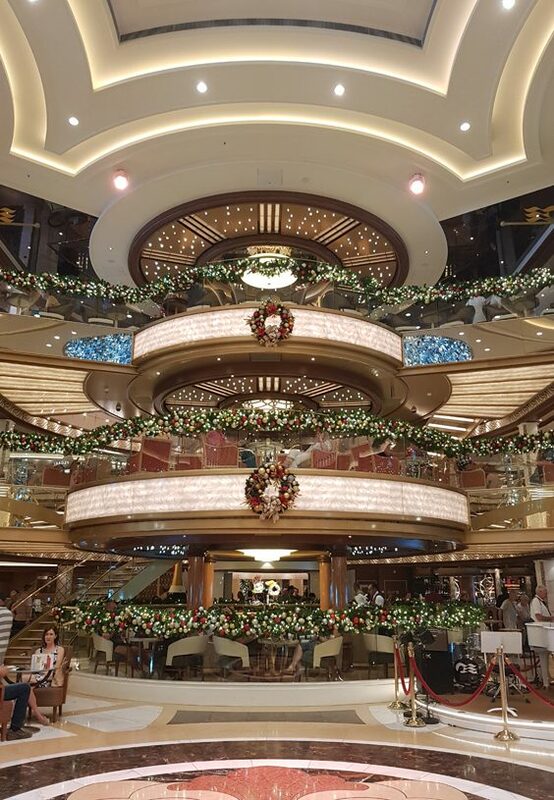 Sixteen decks; a glorious main theatre, and assorted dining rooms, eating areas, coffee shop and more mean we’re in our element. If nothing else it’s great just to get away from the endless Brexit/Trump nightmare, and with no desire to sign up for a WiFi package, it’s quite easy to be happily cut off from the rest of the world. I’d planned on coming to Australia for decades, and though my mid-nineties plans fell through, finally making that dream a reality is a major tick on my bucket list. 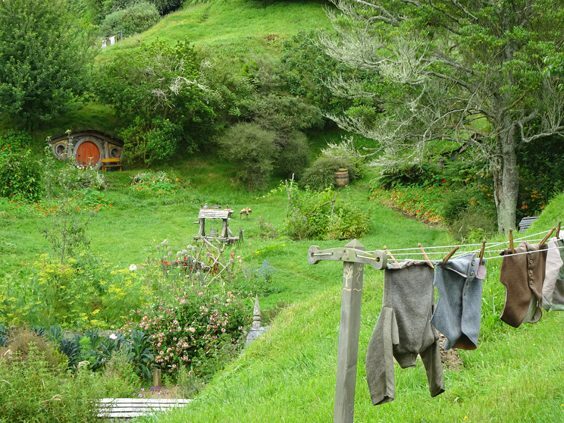 New Zealand, on the other hand, had been a goal since I spent countless hours watching documentaries on Jackson’s Lord of the Rings, and how he defied the odds to make the biggest film saga ever made in Australasia. Our excursions do not disappoint. 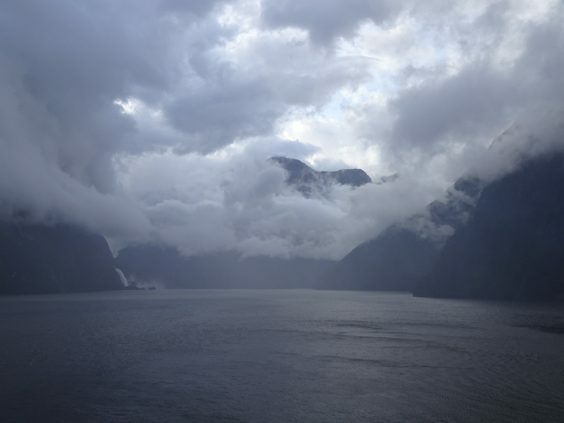 Before we even set foot on land, we sail through Milford Sound, a fiord in the southwest of New Zealand’s South Island. This gloriously atmospheric region of fog and waterfalls looks like it could have doubled for any prehistoric movie. It’s an unforgettable experience sunbathing on a luxury cruise liner as the backdrop suddenly turns into a scene from a Hollywood dino epic. Had a pterodactyl soared overhead, I would not have been surprised. 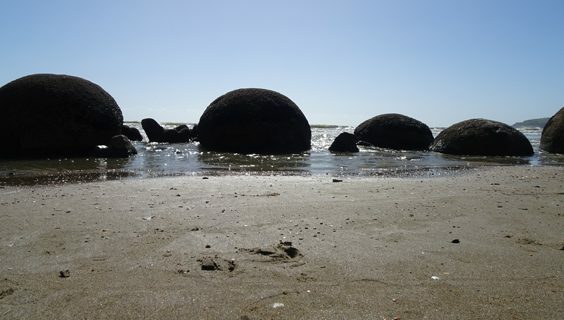 I discover three sea days is my limit before going a little stir crazy, so by the time we set foot on dry land, it’s a treat to explore moeraki boulders – spherical rocks (or concretions) at Koekohe Beach, in Oamaru (also on the South Island). We later enjoy a visit to a Steampunk HQ. As a huge fan of Victorian-inflected sci-fi and fantasy, this mix of art collaboration and gallery is a genre fan’s dream. Oamaru is glorious place, bursting with artsy/crafty shops, second-hand book stores and terrific eateries. In the days that follow we also sample the delights of Auckland (Piha Beach, where The Piano was partly filmed), and at the Bay of Islands (our last port day), witness a fantastic Maori song and dance ceremony, and best of all get to row a Maori war canoe. (Top tip: take a waterproof camera). The whole thing is obviously not a cheap experience, but it’s worth every penny, and cruising to assorted ports around New Zealand is a lot more fun and stress-free than driving. It doesn’t hurt that we get to enjoy some terrific on-board entertainment, including Steve Larkins’ ‘Mercury Rising’, the best Queen/Freddie Mercury comedy tribute act I’ve seen. Princess have really upped their game since the last time I sailed with them (on a mini voyage round the UK and Ireland). Just the in-room movies left me a happy punter, not to mention Movies Under the Stars – a top-deck communal experience, which is a must for those who love nothing more than crashing out on a sun-lounger with a bag of popcorn, and soaking up a great film. Oh, and the beds ensure any initial jet lag melts away like many of the delicious ice creams we obtain on the upper deck. Okay, there could have been more choices for vegetarians, but that aside the assorted kitchens do a fine job of catering for the thousands of travellers. The room service is also very good, as we discovered on New Year’s Day with a selection of breakfast goodies. Celebrating several New Years within a few hours is one of those experiences we’ll not forget in a hurry. Five of them in total, including Blighty’s new year at midday. While there’s plenty of recreational activities, from ping pong, basketball and swimming to enjoy, sometimes it’s the simplest which appeal most, such as trivia quizzes in the Princess Live studio area. Being a movie and 007 obsessive, I’m chuffed when I walk off with two back-to-back wins, but there’s plenty of head-scratchers which leave us happy just to soak up the atmosphere. The acid-test for any great holiday is would we do it all again? Well, we’d go via LA, Dubai or Singapore next time for the variety, but in terms of the cruise, a repeat excursion would be a dream revisit in a few years. As intriguing as ITV’s The Cruise is, telly cameras don’t really do the Majestic Princess justice. It’s a glorious way to travel, beautifully designed, and little wonder passengers (such as us) bond with it as they trek from port to port. In short: it’s one cruise to rule them all.